“It’s not a soccer trip!” I emphatically say. What this trip will be is simply a smidgen more than 12 hours of live World Cup soccer scattered over a 15 day stretch of summer vacation. That’s practically nothing! 3.33% of the entire trip! 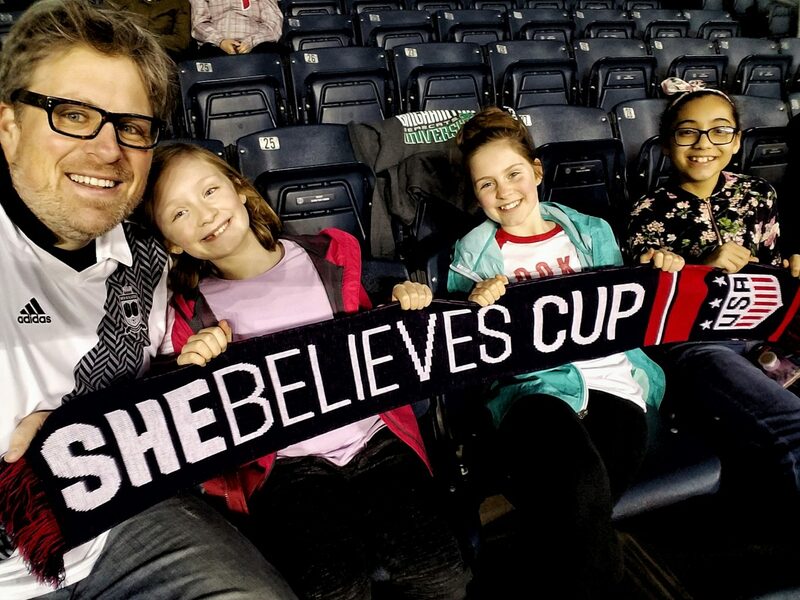 The tween and I enjoy HT of a Women’s Soccer match in the She Believes Cup. We’ll enjoy more soccer games during the 2019 Women’s World Cup in France this summer. 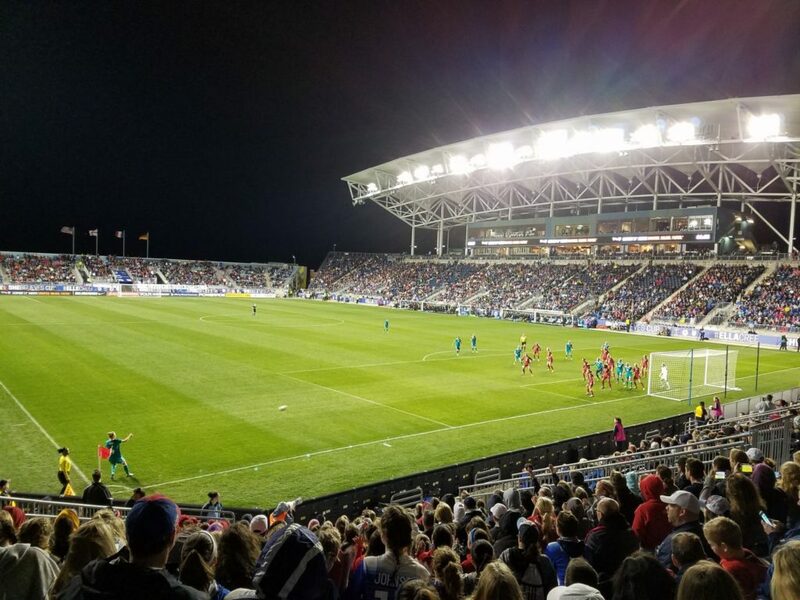 The impetus for this summer’s 15-day European trip was, undeniably, the 2019 Women’s World Cup in France yet I am couching our 2019 Women’s World Cup summer vacation in these defiantly non-soccer terms because, while my daughters and wife are willing to indulge my soccer obsession, the truth is that soccer is my obsession alone. Here we were, cheering on the Utah Royals and USWNT star Christian Press, during a late June 2018 match versus Carli Lloyd and her Sky Blue. Me, the one and only guy in my house (even our three cats are ladies! 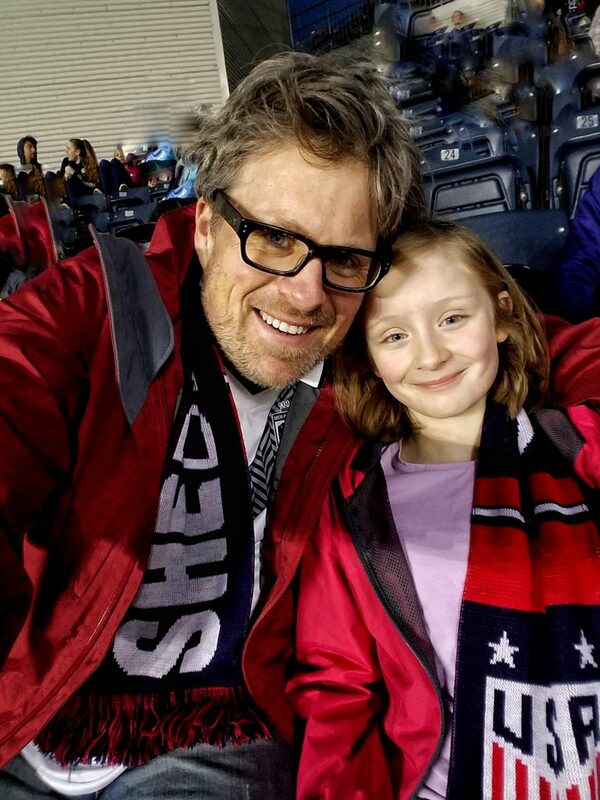 ), I’m the only one who sees it as a duty and an absolute joy to support the women’s game. Go figure. Whatevs, we are going to France in June to see a total of six Women’s World Cup matches and while we made the transatlantic trip, visit a total of seven new-to-us countries over the course of two weeks! 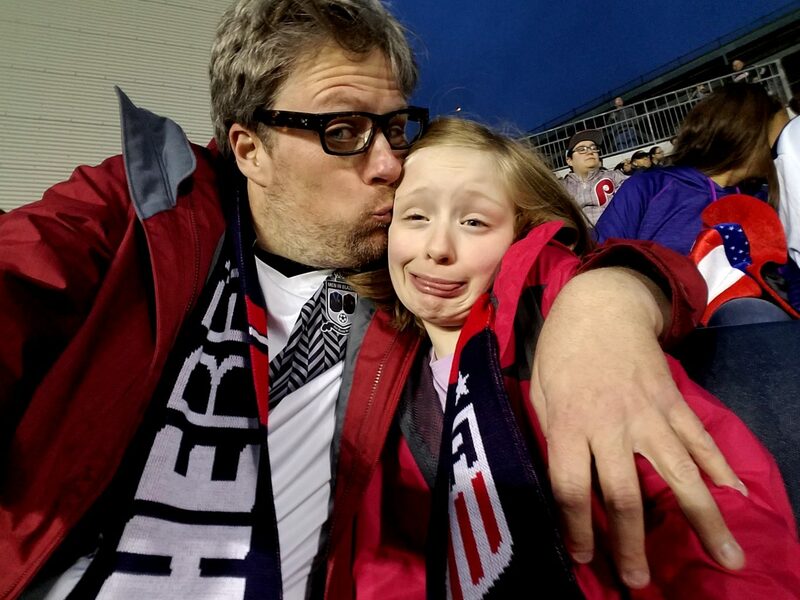 Here’s our plan and how you and your family can also attend the 2019 Women’s World Cup in France. The cheapest flight options, as per usual, were via Norwegian Air from New York’s JFK airport into Charles De Gaulle in Paris. We snagged our roundtrip flights for just about $725 per person. Not great but not bad for Paris in the summer. Sold! Check out how to get a U.S. Passport! back in Paris again, making our new-countries-to-us-road-trip route not only possible but relatively easy. The World Cup soccer portion of our trip starts in Le Havre but not with our beloved USWNT. Buying Women’s World Cup 2019 tickets was so easy and affordable with group stage matches starting at just 9 Euro (about $10) each that I picked up a couple of non-USA related soccer games too. At $10, it means it is cheaper to buy a ticket to the 2019 World Cup than it is to a movie! The first Women’s World Cup 2019 match I bought tickets for is the Friday night, June 14 2019 game between England and Argentina, after which we will see the D-Day sights of Omaha and Utah Beaches, visit the charming seaside village of Honfleur, and try to reach the epic medieval city of Mont-Saint-Michel before returning to Paris to see the USWNT take on Chile at the Parc des Princes, the regular season Ligue Un home of Neymar, Kylian Mbappé, and the rest of Paris Saint-Germain. 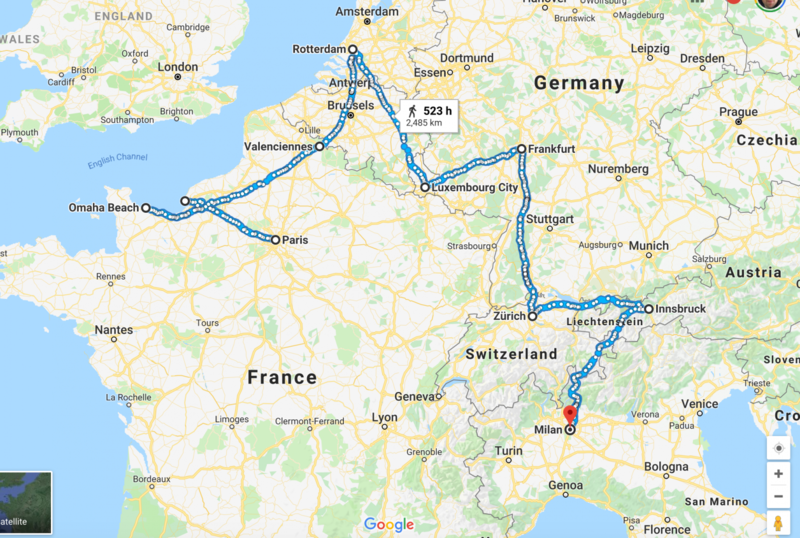 Google Maps caps you at 10 stops but this is the general idea of our 2019 Women’s World Cup Roadtrip! While we zigzag the north and east of France to see additional Women’s World Cup matches between USWNT and Sweden, Italy and Brazil, then (hopefully) watch our magnificent ladies triumph versus Spain or Germany and finally, win a quarterfinal knockout clash against host nation France, we will visit for the first time ever, Belgium, Netherlands, Luxembourg, Germany, Switzerland, Lichtenstein, Austria, before dipping into Italy on our way back to Paris. Phew. A lot of driving but you can reach all those European countries in a matter of days! It’s like driving across 9 states in the eastern part of the U.S. only each has a different language, unique foods and a smattering of castles! With any luck, we will not only see, taste, and enjoy the best of western Europe on this “not soccer trip” but also that the ladies in my life will come to love the U.S. Women’s National Team every bit as much as I do as Lavelle, Push, Morgan and Ertz march on to add another World Cup star on their red, white and blue jerseys. Discover these 4 tips to make packing easier for your next vacation!